WELCOME TO QUAIL RIDGE FARM! 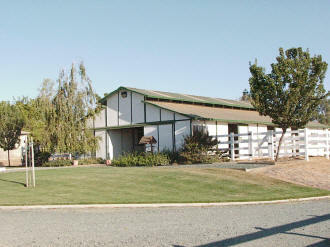 Quail Ridge Farm is located just south of Sacramento in the horse-oriented community of Wilton, California. We are located just a short 20-minutes from the well-known Rancho Murieta Equine Complex and are also in close proximity to local rated and schooling shows. For advanced medical care, we are less than an hours drive to the UC Davis Veterinary Medical Teaching Hospital. For the active horse and rider, Quail Ridge Farm offers a quiet atmosphere for learning, with the focus on dressage. Due to the fact that Quail Ridge Farm is a smaller facility, the needs of both horse and rider can be addressed in a personal and professional manner. For the retired horse, Quail Ridge Farm offers a quiet, safe and peaceful home for horses in their later years. Pastured horses are given the same attention to detail as those horses currently in the peak of their show years. Horses are grouped (3-4 horses per pasture) according to feed needs and personality types. Owner/trainer Wendy Rhea treats all of the equine residents at Quail Ridge Farm as if they were her own with personal careful attention and care.